- UAE – Qalhat – Bat - Under a comprehensive development plan, the Ministry of Heritage and Culture (MoHC) is planning to develop the historical sites of Qalhat and Bat as tourist spots after their restoration and conservation. A team of French and US researchers have been excavating the sites for the past few years to discover more aspects about them. Axelle Rougeulle, from National Centre for Scientific Research, Paris, who has been working as the director of Qalhat Project since 2008, said at a recently-held seminar that the archaeological site of Qalhat served as the main harbour of trade in the Indian Ocean during 1250 AD. "The site has been very important from historical point of view, but nothing is visible of the glorious past except the Bibi Maryam mausoleum," she said. Axelle said that the objective of the project is to study Qalhat's town planning, find more about its history, culture and economy, to document the part played by the harbour in trade networks in the Indian Ocean and to build a chrono typology of the ceramics traded from the 12th to 16th centuries. Biubwa Ali al Sabri, director of the Department of Excavations and Archaeological Studies, MoHC, said, "We want to prepare the sites for tourists but it will take some time." Talking about Bat, which is considered to be the most complete collection of settlements and necropolises from the third millennium BC in the world, Biubwa said, "We have a management plan for the entire site, but right now we are focusing on fencing the perimeter to save it from trespassers and encroachers. We also plan to restore one of the biggest towers discovered (at the site) by a Danish team in 1970s." She said the historical site faces threat from the wadi in the vicinity which is eating away at the foundations. The five year project at Bat carried out by a US team has come to an end, but professor Gregory Possehl who heads it is optimistic that the MoHC will provide financial aid to extend it. "We are on the verge of new momentum." - LAOS – Xiengkhouang - Xiengkhouang, an area situated in the north of Laos, famous for the mysterious Plain of Jars which are stone jars in different sizes carved out of solid rock scattered all over a plateau. 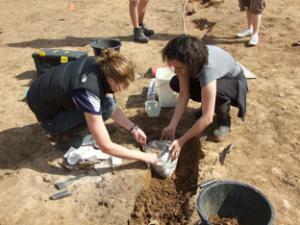 Its historical archaeology traces back more than 2500 – 5000 years, and its purpose is still unknown to scientists. The Indochina war began here in the secret land of Laos and on this tour you will see the after war-affects on ancient sites. - USA – Jamestown - When archaeologist William Kelso began digging at Jamestown in 1994, few historians gave him much chance of finding the long-lost English fort of 1607. Most believed the pioneering outpost had disappeared into the James River by the 1800s. But 17 years after first sinking their shovels into the soil, Kelso and his team have not only found the "Holy Grail" of American archaeology but also rewritten the story of the nation's first permanent English settlement.Instead of being lost, building after building left its footprint in the ground, preserving a townscape that was previously known only through scattered descriptions. A million artifacts have surfaced too, debunking many long-held myths about the Jamestown colonists' character. When the team uncovered the 1608 church where Pocahontas married John Rolfe, the 2010 find ranked among the world's most important. But that triumph hasn't stopped the celebrated archaeologist — who turned 70 in March — from launching one of his most ambitious seasons. In addition to searching for the west end of the church, Kelso and his staff — aided by the students of the Jamestown Rediscovery summer field school — will probe the remains of an unusually well-preserved "mud and stud" structure that may have been the fort's 1608 guardhouse. They'll begin exploring a previously untouched area near the 1907 Memorial Church and open up a critical part of the Confederate earthwork heaped on top of the forgotten fort in 1861.They'll also hunt for signs of an expansion that may have doubled the fort's size — and convinced settlers to move their church to the middle of the newly enlarged outpost in 1617. - INDE – Karnataka - Declared as a protected ancient monument by the Directorate of Archaeology and Museums in Karnataka under Section 3 of the Karnataka Ancient and Historical Monuments and Archaeological Sites and Remains Act 1961, the Kadu Malleswara Temple at Sampige Road, Malleswaram is getting a modern makeover. Destroying the stone pillar beams bearing ancient inscriptions and iron grills, the Department of Hindu Religious and Charitable Endowments has marked and drilled holes for putting up aluminium ducts for coolers in the stone beams. This has been a strong violation of the Act, spoiling the sanctity of the temple as well. Kadu Malleswara, a Shiva temple, is the only temple in Bangalore which has been declared as a protected ancient monument. According to the Kannada inscriptions on a rock enclosed to the right of the temple, the temple dates back to 1668-69 built by Shivaji’s father Shahji. It is also the only temple where Gods Shiva and Vishnu are being worshipped in the same temple premises. Besides, there is a shree chakra in front of God Bramaramba that is rarely found in any temple. - ROYAUME UNI – Heslington East – Students have discovered a rare 4,000 Bronze Age urn at the University of York’s new campus. The students, from the Department of Archaeology, found the collared urn, which contained cremated remains, and another creation burial, at the site of the university’s campus expansion at Heslington East. 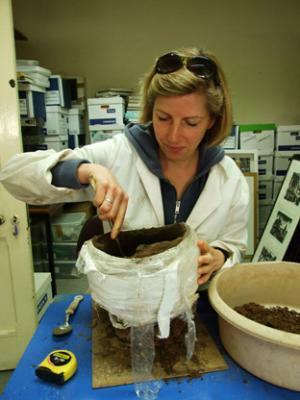 The find was removed from the dig undamaged by specialist conservators from York Archaeological Trust and the cremation was excavated from within the pot by Malin Holst, of York Osteoarchaeology Ltd, at the university’s archaeology laboratory at King’s Manor. Malin Holst, who is also a teaching fellow at the University of York, said some of the fragments of bone which had survived the cremation process belonged to an infant, but full analysis of the pot and cremation is still underway. Digs at the Heslington East site has already uncovered the remains of an Iron Age skull and brain, found in 2008, with brain matter in the skull which dated back about 2,500 years, making it one of the oldest surviving brains in Europe. - USA - Chihuahuan Desert - Deep in the Chihuahuan Desert not far from the Mexico border, archeologists are busy digging up the first bison bones ever found in this remote area of Texas, which they hope will shed light on the little-understood lives of the inhabitants of the region in prehistoric times. The discovery in the Nature Conservancy's Independence Creek Preserve is considered significant because it came at a place where two very different cultures lived in close proximity. The archaeologists hope that analysis of the bones, along with tools, charcoal from ancient fire pits and other artifacts found nearby, will provide clues to why the two peoples had different lifestyles, ideologies and possibly, religions. Bison were an important part of prehistoric life, a major component of human diets, customs, clothing and hunting patterns. Bones have been found throughout much of North America, but never in the Eastern Pecos region — a desert area that includes Big Bend National Park. Archaeologists hypothesized the bison may not have been able to cross the Pecos River. Yet, they were perplexed by accounts from early Spanish expeditions that described native peoples using buffalo, said Sam Cason, a project archaeologist. Just from looking at the soil and the artifacts uncovered, Cason believes the upper deposits are from the late-Prehistoric Period, or 700 AD to 1600 AD. The lower deposits are likely from the late-Archaic Period, dating 1500 BC to 700 AD. Carbon dating will provide archaeologists with more precise information.The research aims to determine how the bison were killed, in what season and possibly how many people were in the hunting group. "These bison bones were in the midst of all that debris. That tells you that the bison bones were part of a larger cultural event," Cason said. The analysis could determine in this area where the two cultures met, they overlapped and had previously unidentified similarities. Anthropology - Archaeology's programs available online learn when and where you want.